BUSHWICK – The last Community Board 4 meeting before the summer break was expected to go smoothly: a presentation on zoning changes, the election of new board leaders, and an update on the Bushwick Community Plan. And it did, for a while, with the audience sitting respectfully through a monotone presentation by the Department of City planning and the board’s election of a new chairperson and committee. But when it came time for an update on the Bushwick Community Plan, protestors in the crowd weren’t silent anymore. A group sprang to their feet and unfurled anti-gentrification banners, with slogans like “Bushwick Is Not For Sale” and representing the Brooklyn Anti-Gentrification Network. They used the “human microphone” technique to amplify the voices of speakers above the meeting, bringing proceedings to a standstill. In the video above, a protestor relates her experience as a life-long Bushwick resident facing displacement due to rising rents. The protestors opposed all development or rezoning, they said, and called out initiatives like affordable housing percentages as enticements for investors and developers, not solutions for the poor. They decried the specific targeting of communities of color and of the working poor during rezoning, as well. Importantly, the protestors were entirely in opposition of the Bushwick Community Plan, a collaborative effort between residents, City Councilmembers and community groups to make assurances regarding affordable housing and neighborhood preservation in the face of both ongoing gentrification and the full-on rezoning of the neighborhood that many see as inevitable. Once it became clear the meeting wasn’t going to get back on track, board members moved towards the mass of protestors, with both sides raising their voices and engaging in a brief bit of pushing that was quickly broken up by 83rd Precinct NYPD officers in attendance. 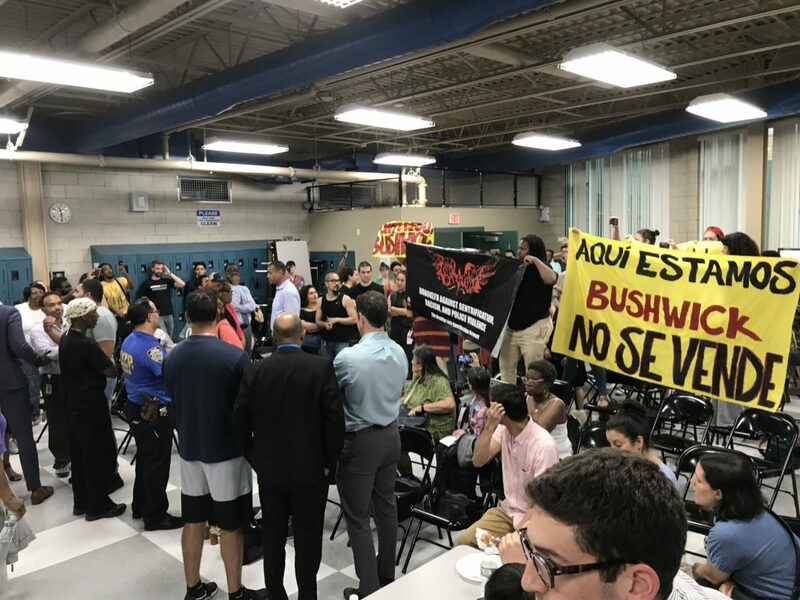 Many board members tried to tell the protestors that the Bushwick Community Plan they were working on was part of the fight against gentrification, appealing to a sense of unity. The protestors, however, weren’t interested in common ground with anyone working hand-in-hand with the city. As RiseBoro staff and board members folded up the tables and chairs, disassembling the meeting around the protest, local leaders like Councilmember Antonio Reynoso worked to start any kind of dialogue. “A lot of people seated across from you agree with you,” he started, before being cut off by accusations that by voting for the Mayor’s housing plan, the City Council had sold out communities. Only chants of “Stop the Process!” and “Stop the Rezoning!” came back in response. Councilmember Reynoso quieted the crowd long enough to turn the mic over to outgoing CB 4 Chair Julie Dent, who has served on the board since 1981, to adjourn the meeting. The city planning commission is currently considering rezonings in Manhattan in the East 30s and on Flatbush Avenue, where wealthy white homeowners are organizing about adding more housing for rich people in their rich neighborhood. It would be great to see those approved to take some of the gentrification pressure off Bushwick. Bunch of morons. Do they really think that by shutting down the processes of democracy they are furthering their cause? Unless you own something, what gives you the right to assume you can live there in perpetuity? I would like to live on the UES but can’t afford it so I don’t live there. As a life long Bushwick resident I am glad to see development come to this once neglected neighborhood. 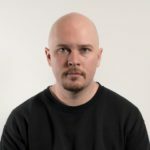 When I was younger and had little money, I had to move several times after getting priced out of apartments. No protesters came to my aid. But that’s okay. I worked hard. I saved. Eventually I bought my own place. Times sure have changed. How much do the so-called processes of democracy matter when a few million (or billion) dollar donation from a developer can drown out votes? Who really represents us? Maybe if the politicians in power were not beholden to developers and those of their class the protesters would not have shown up in the first place. Maybe if you would’ve taken a stand you wouldn’t have needed to move. I know just standing there and being pushed around and sucking up to those in power while chiding those who are just trying to survive and live the best they can is the cool thing to do these days but in the long run all it leads to is the same behaviors happening again and again. Remember that a lot of what Americans take for granted (ex. 40 hour work week, Civil Rights Acts) came with protests and marches, not peacefully and politely telling those in power to please please please listen to us. If your family has lived in this area for generations, or even a decade or two, and you don’t own a single or a two family yet, I just feel sorry for you. What happen? You benefited from a free market and didn’t work it. You may as well yell at your dad. Rezoning won’t hurt you but doing nothing, you will most certainly face displacement. Capitalism will roll over you and you can shout at whoever you want but it won’t make any difference.